When it comes to fish, customers are most commonly interested in the freshness, quality and point of origin of the product, but nowadays more and more consumers are also demanding information about the social responsibility of the producer and the retailer. 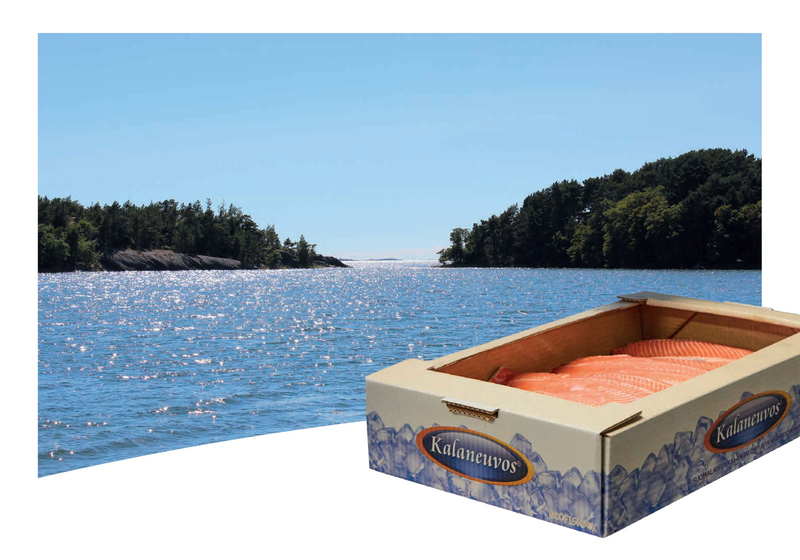 The Finnish fish brand Kalaneuvos decided to become a pioneer and now packs its fresh fish fillets into leak-tight EcoFishBox™ corrugated board boxes instead of expanded polystyrene (EPS) boxes. As fish business is closely tied to natural resources, environmental responsibility is naturally one of the core values of the family-owned V. Hukkanen Oy, which owns the Kalaneuvos brand. In January, the company began to pack its fresh fish fillets into corrugated board boxes made from Finnish wood fibre, which are an excellent choice not only for the fish and the stores that sell them, but for the environment as well. "We are constantly looking for new ways to reduce our environmental impact and develop our operations, so the EcoFishBox™ is a natural continuation of our long-standing environmental protection efforts," states Mari Heikkilä, Marketing Communications Manager at Kalaneuvos – V. Hukkanen Oy. The packaging for fresh fish packed in crushed ice must be hygienic, leak-tight and moisture resistant. The establishment of a cold chain that extend from the sea all the way to the dinner table has enabled companies to start looking for alternatives to EPS boxes. Thanks to the combined development efforts of Stora Enso, Kalaneuvos and the retailers, there is now a new Finnish alternative made from renewable wood fibre on the market, a leak-tight corrugated board packaging solution with excellent stackability properties. The concept also includes automatic box erecting and ice bags with leak-tight seams. In addition to being more environmentally friendly, the concept also streamlines the fish packing process and increases hygiene. "The water resistance of the EcoFishBox™ is based on a barrier film laminated onto the board and an innovative corner structure, which makes the packaging leak-tight," explains Sales Development Manager Vesa Penttinen who together with Prodcut Designer Mika Tuhkunen was responsible for the product development project at Stora Enso. 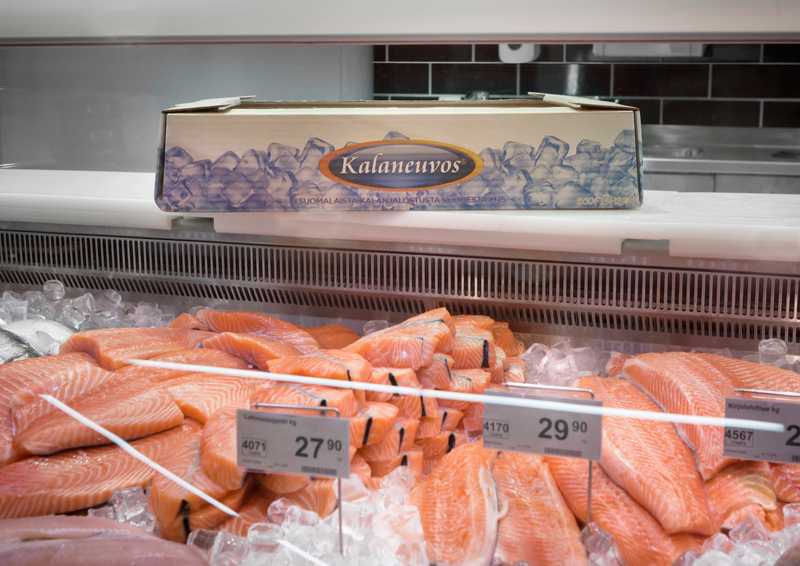 Kalaneuvos – V. Hukkanen Oy is the first packer of fresh fish fillets in the world to have put the corrugated board EcoFishBox™ packaging into wide-scale production use. "We have been efficiently recycling EPS boxes for a long time now while simultaneously looking for a more environmentally friendly alternative to traditional fish boxes. 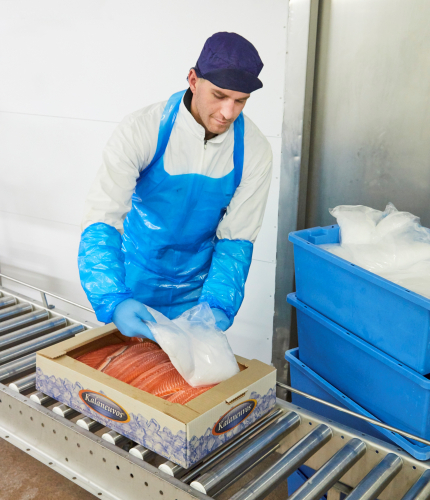 Now, as a result of a comprehensive development process, we have a packaging solution that allows us to deliver our fish products in the same high quality manner as before, but with a smaller carbon footprint. This ecological solution also makes recycling and waste management easier in stores, restaurants and industrial kitchens," says Sulevi Toivo, Sales Director at Kalaneuvos – V. Hukkanen Oy. From the perspective of fish and marine nature, one of the best aspects of a corrugated board box is the fact that it does not remain in the environment for hundreds of years after being disposed of. In fact, the corrugated board commonly used in retail packaging is a fully recyclable material, for which collection and recycling infrastructure is widely in place. Another major environmental benefit has to do with transportation. The boxes are delivered from the factory to fish packers in the form of flat corrugated board sheets. This saves a tremendous amount of space in storage and transport, as a new flat EcoFishBox™ takes seven times less space than an EPS box. This means that the need for truck transportation is significantly reduced, which in turn reduces the environmental impact and carbon dioxide emissions of traffic. For shops, switching to fibreboard packaging makes the recycling of fish packaging easier.As it can be flattened and fully recycled, switching to the EcoFishBox™ can reduce the processing, transport and recycling costs of packaging waste by up to 60%. V. Hukkanen Oy is a traditional Finnish family-owned business that has produced high-quality fish products since 1975 under the Kalaneuvos brand and under various shop brands. The Hukkanen Group is the largest fish industry operator in Finland. The Company is specialised in fish farming, fish processing, wholesale, import and export.The Company employs over 230 people, and the total revenue amounted to over EUR 100 million. The total combined annual volume of fish products processed by the Group is over 20 000 tons. The company is constantly researching new ways of reducing its environmental impact and developing the industry. Stora Enso is a leading provider of renewable solutions in packaging, biomaterials, wooden constructions and paper on global markets. The company's aim is to replace fossil based materials by innovating and developing new products and services based on wood and other renewable materials. Stora Enso employs some 26,000 people in more than 35 countries. In 2015, Stora Enso's sales totalled EUR 10.0 billion. The EcoFishBox™ is a new packaging concept developed by Stora Enso, which provides an environmentally friendly and cost-efficient alternative to the EPS boxes widely used in the fish industry. The concept was one of the winners of the international WorldStar 2017 packaging competition. The concept includes leak-tight fish transport packages, packaging automation solutions and ice handling systems.